Explore Killarney National Park just a short walk from our hotel. Here you will find the famous Lakes of Killarney and the McGillicuddy Reeks, Ireland’s highest mountain range. Enjoy the park’s scenic beauty and nature trails on foot, bike or horseback.Visit St. Marys Cathedral a Killarney landmark and just down the street.Tour Ross Castle and take a boat trip on the Lakes.Enjoy Muckross House and Gardens. 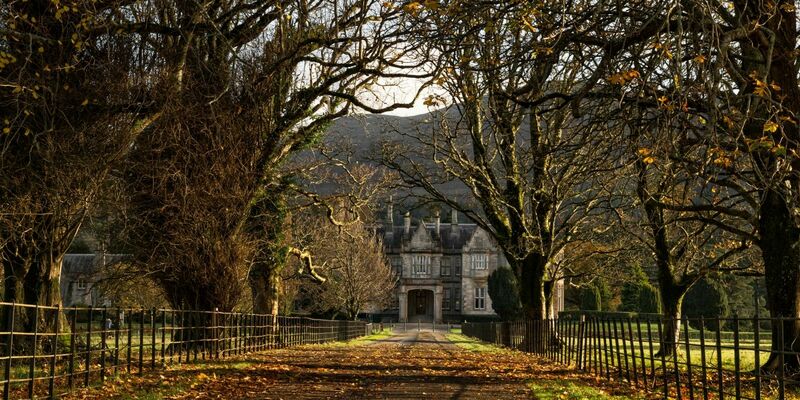 The former residence of Lord Kenmare located in a spectacular setting overlooking the Lakes of Killarney. Experience Muckross Traditional Farm depicting rural life in the early 20th Century. Famous Ring of Kerry Drive. A spectacular drive to the Atlantic Ocean and over the Kerry Mountains. Dingle Peninsula – Discover the rugged coastline scattered with ancient huts and Irish heritage. Stroll the Beaches of Rossbeigh and Inch. Crag Caves a wonderland of Stalagmites and Stalactites. Discovered by cave divers in 1983. This natural, all weather attraction has dramatic sound and lighting effects. It is thought to be over a million years old. Enjoy Hiking, Trekking and Trail Riding in Killarney National Park.